For some people, no visit to the Galapagos would be complete without seeing some of the finches which Darwin observed there. He wondered, “Why do they differ from island to island?” and The Origin of Species was the result. Finches are nice but for me the tortoises were the big draw! 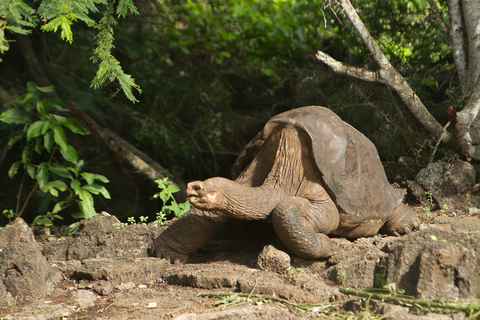 Most people have heard about Lonesome George, the tortoise on Pinta Island which was estimated to be 102 years old. He was the last of his subspecies; that line ended when he died in 2012. George was the icon for all the Galapagos National Park is doing to maintain the varied environments which gave life to so many unique species. 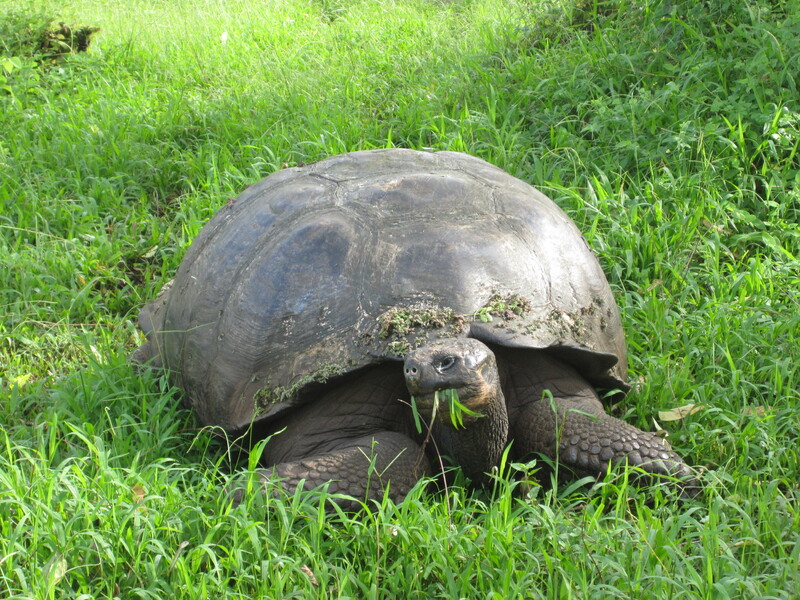 Other subspecies of the Galapagos giant tortoise live on other islands. On our December visit to the islands we were able to see many on a visit to Santiago Island. Lonesome George lived on a desert island. The habitat for the tortoises we saw is much greener. Where George had to be able to extend his neck to reach leaves on branches (and to outmaneuver other males in dominance displays during mating seasons) he benefited from having an arch in his saddle-shaped shell. The tortoises we saw spend their days munching grass and other low-growing greens and are less aggressive or competitive than the desert island species. Their shells are evenly domed with no arch at the neck. They browse happily and slowly all through a protected preserve, looking at first glance like big rocks set out among the fields. The grassy feeding area we saw is at a higher elevation than the nesting grounds. In nesting season the females cross (slowly, slowly) to the drier lowlands and lay their eggs in sandy soil. They cover the eggs with sand and then urine to keep predators such as rats and other non-native animals away. In recent years conservationists have dug up the clutches of newly laid eggs and taken them to an incubator and hatchery for best survival rates. The hatchlings are kept there until they are five years old so they are better able to withstand the challenges of survival on their own. The Galapagos Islands used to teem with tortoises. (Galapago is the Spanish word for tortoise.) Tortoise population was around 250,000 in the 16th century. With the advent of ships filled with sailors looking for an easy-to-catch meat source, the population was hunted down quickly. (A typical male can weigh 600-700 pounds, and a female half that size. That can make a lot of soup!) With the human immigrants to the islands adding non-native animals such as rats, goats, and pigs, and clearing tortoise habitat for agriculture, the tortoise numbers dropped to a low of around 3,000 in the 1970s (a 99% loss). Since then the Ecuadoran government has made consistent, serious efforts to reestablish tortoises in their native habitats. As a lover of all varieties of turtle, land or sea, I was very tickled to see so many of these gentle giants in person. 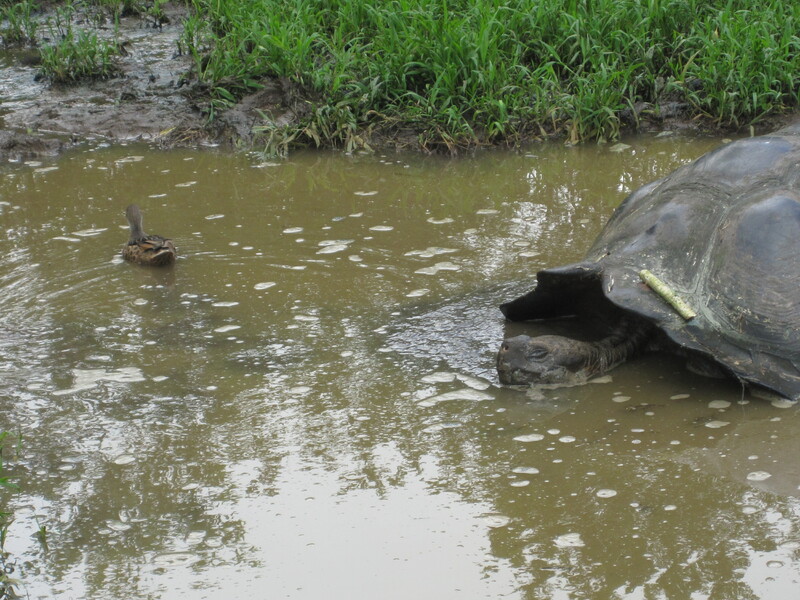 These tortoises are the largest living species of tortoise and the longest-lived vertebrates. I am very grateful to the people of Ecuador for their forward-looking conservation efforts to protect the creatures. I would love to send you there to see them – or the finches, or marine iguanas, or boobies or frigate birds, or albatrosses, or Sally lightfoot crabs. 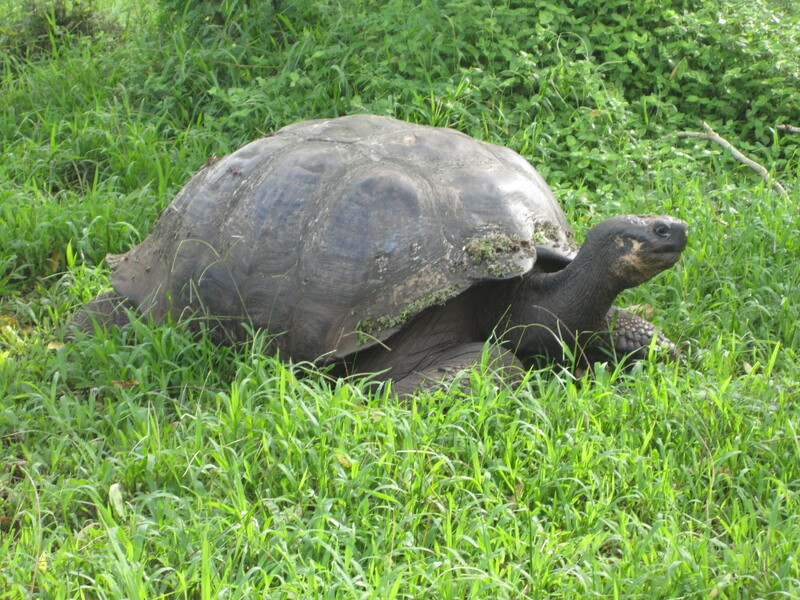 This entry was posted in Travel, Uncategorized and tagged conservation, Ecuador, Galapagos Islands, Origin of Species, tortoise, travel. Bookmark the permalink.